View Poll Results: Which Hermes EDC/EDOV formulation is your favorite? Haven't smelled them all yet. ...and has a solid opinion on how different/similar it is to the 1997 version we all know and love. ...and it is said to be similar to 1997 Eau D'Orange verte, except with more Oakmoss, unsurprisingly. Truly a groundbreaking EDC, using papaya and mango in the classiest unisex way in 1979!! Last edited by DULLAH; 15th February 2010 at 08:41 PM. How do i tell the difference between the 97 and the 09? Is there a difference in the bottle? The 2009 bottle is the same as the "Pampelmousse Rose" and "Gentiane Blanche" bottles. It features a cast-in-glass crest and smalle printed logo towards the bottom, whereas the 1997 bottle had only 2 printed logos, no cast-in crest. I actually prefer the new bottle. Can't comment on the scent, though - would love to hear everybody's impressions. Dullah, are you sure they reformulated in 2009, or did they just change the bottle? I have the 1997 version and I love it! Hopefully someone can comment on the new bottles smell? Edit: OK, I just googled it. The 2009 version is actually a totally new interpretation of the classic, with the new one being composed by Jean Claude Ellena. Anyone know if the old one is gonna be discontinued now? Last edited by L'Aventurier; 7th November 2009 at 02:19 AM. While EdOV has at least one shortcoming (i.e., its extremely ephemeral topnotes), the idea of a totally new interpretation of it is a very disappointing notion to me. Some things should be respected and not altered. I do hope to try the 2009 version though to see what it is like. At the Hermes site they describe it as, "An intense and invigorating freshness with a woody signature", with no direct reference to reforumulation. Woody signature? Also it is listed under Les Colognes Hermès with Pamplemousse Rose and Eau de Gentiane Blanche. Okay, anyone who has smelled this and the previous incarnations, please share with us the differences (and similarities)! The old one can't possibly continue - its basically made of IFRA restricted ingredients - various citrus components and oakmoss. But don't worry, there will be enough of the 1997 version floating around for years and years on ebay and online discounters. I still have yet to smell the 2009, but am very eager due to the piquancy and tartness of blackcurrant. I am not a big citrus fan but this one by Hermes is pretty good. OK, I just noticed I had the new bottle all this time LOL. It's the same dark green as the old 1997 ones, but the logo is engraved into the glass. Last edited by L'Aventurier; 11th November 2009 at 05:44 PM. I've only tried the new stuff once at a perfumery and found it decidedly inferior, as it smelled decidedly less of natural oils. What works for Terre d'Hermes is a desecration in the case of Ed'OV. My vintage bottle has lost too many topnotes for proper judgement, but the base does seem mossier. I can live very well with the 97 version and will try to stock up a little, especially as this ios one of the few things my wife both enjoys and can wear without an allergic reaction (oh the irony). I have been using this since its launch in 79,and have just bought a new bottle last week .The Hermes store said it was exactly the same formulation with no change , just repackaged .To be honest I have not noticed any dramatic difference in the 09 version ,it seems if anything a little more citrus on the opening but that is all ! I would love to know what Hermes have done with all the old stock , as I never saw any of it reduced ,it has probally been destroyed as they do with the unsold sale items !!! I just wish this lasted longer than it does as I really like it and enjoy it. It smells so natural to me. Maybe I should try to track down the vintage version. Any idea where I can get some? Many older bottles were popping up on ebay a few months ago. My vintage bottle has lost too many topnotes for proper judgement, but the base does seem mossier. Is this vintage bottle labled "Eau D'Orange verte" or "Eau De Cologne"
I am interested in the first generation , prior to being called "Eau D'Orange Verte"
This first generation is listed most of the ingredients the same as the 1997 version, except with the additions of Honeysuckle and Sandalwood. If your vintage bottle is the 1979, can you detect any honeysuckle or Sandalwood? This is a very interesting point you bring to the table Dullah. There is a store in Copenhagen which, last time I visited, had 2 minis of Eau de Cologne Hermés - I think one empty and another with juice still in it. I dont know if the juice is compromised, but perhaps next time I visit the big smoke, I might try and check it out (at this rate, that will be early March). It would certainly be interesting to compare formulations. PS: Your poster is from a 1991 campaign. The one I have pictured above is from 1982... the earliest I could find. Last edited by Sorcery of Scent; 15th February 2010 at 08:29 PM. or especially of any history regarding on of my all-time favorite scents. I wonder was the name change when the 1st reformulation took place? removing the honeysuckle and some moss? perhaps 1997 was just a bottle change? Last edited by DULLAH; 15th February 2010 at 08:45 PM. When I was using it in 91-92, it was eau de cologne Hermés and it had the crest at the top. Precisely as pictured in your top photo. I remember it distinctly. In my pic the Hermes logotype sits above the Carriage logo, and the fragrance name sits at the bottom (this is when it read "Eau de Cologne Hermes"). 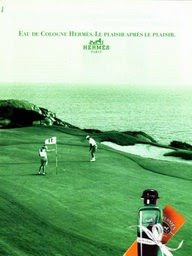 On your last pic it has the word HERMES above the logo, and "Eau d'Orange Vert" beneath the logo. The Company name is repeated at the bottom of the front of the bottle. Last edited by Sorcery of Scent; 16th February 2010 at 07:51 AM. above is from 1982... the earliest I could find. So the earliest bottle has the Hermes crest high on the bottle, and text saying "Eau de Cologne" sitting very low on the bottle. 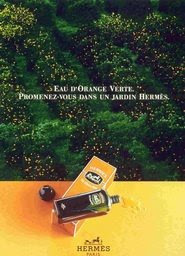 Then the campaign you said is from 1991, has the hermes crest, high on the bottle, with "Eau de cologne" as a part of the crest, and nowhere on the bottle is the word "orange" or "Verte"
Does anyone know what year the "Eau D'Orange Verte" name came about? Clearly prior to 1997, and after 1991? Weeeelll... its a bit more complicated than that... there is also an early version of the bottle with a different variation again. Yes there are approximately 8 or 9 ads in this campaign. OK, so this is a run down of the full-size bottles. I haven't included miniatures, because their configuration of logos etc are very diverse. I've also omitted the EdOV flankers (Aroma d'Orange Verte, Aroma d'Orange Verte Icy Energising Spray and Concentrée d'Orange Verte). Last edited by Sorcery of Scent; 16th February 2010 at 07:59 AM. ^Yes! This seems about right. Eager to hear opinions of the early "Eau De Cologne" formulation! Nice presentation Dimitri. The approximate dates under each bottle would be a nice addition.